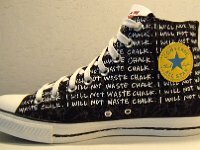 Photos of Converse All Star Chuck Taylor Bart Simpson High Tops. 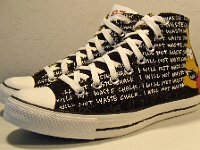 Click on the i for more information. 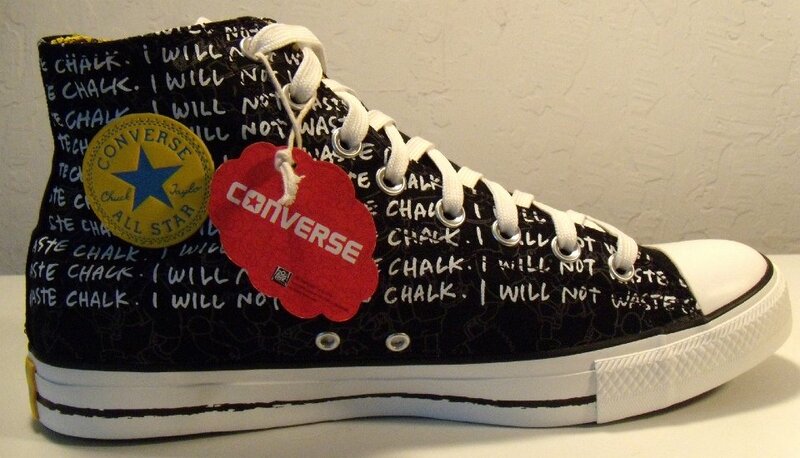 1 Bart Simpson High Top Chucks Inside patch view of a right Bart Simpson print high top chuck. 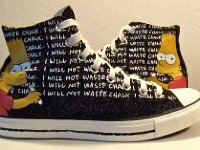 2 Bart Simpson High Top Chucks Outside view of a right Bart Simpson print high top chuck. 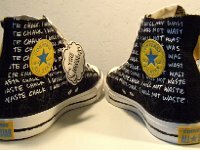 3 Bart Simpson High Top Chucks Inside patch view of a left Bart Simpson print high top chuck. 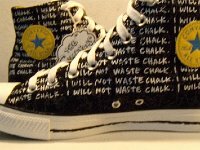 4 Bart Simpson High Top Chucks Inside patch view of a left Bart Simpson print high top chuck. 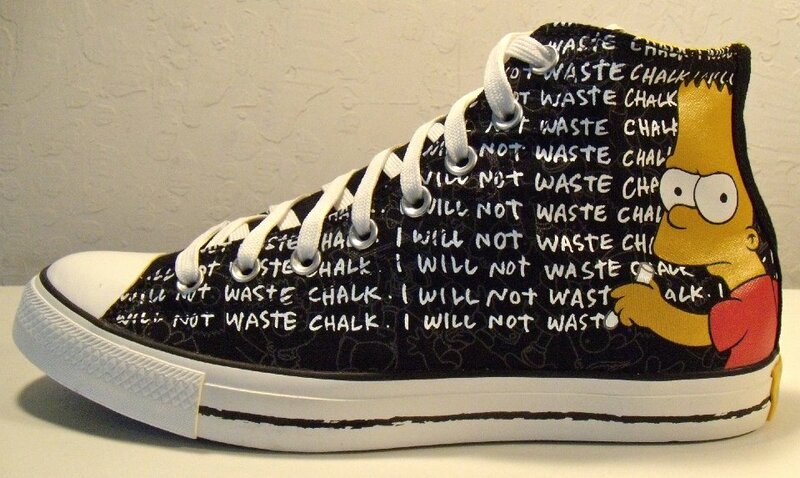 5 Bart Simpson High Top Chucks Outside view of a left Bart Simpson print high top chuck. 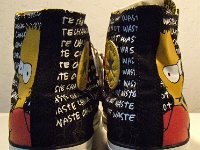 6 Bart Simpson High Top Chucks Rear view of Bart Simpson print high top chucks. 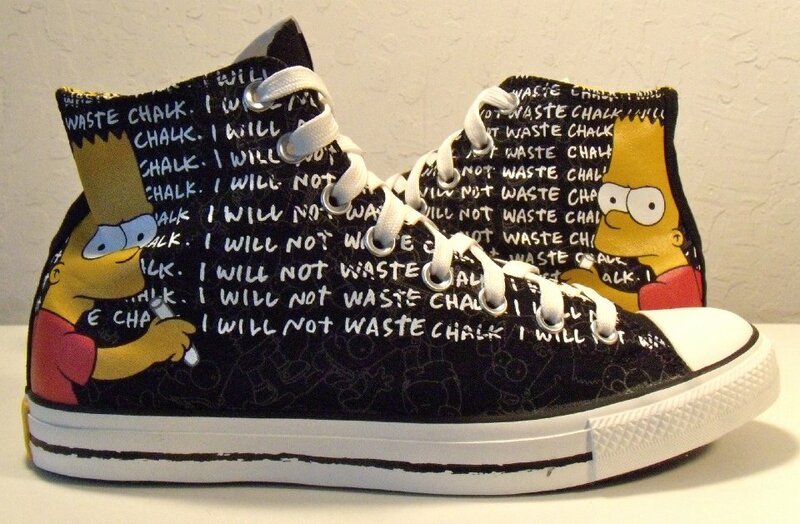 7 Bart Simpson High Top Chucks Angled rear view of Bart Simpson print high top chucks. 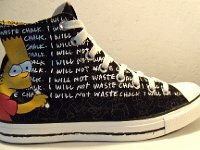 8 Bart Simpson High Top Chucks Angled side view of Bart Simpson print high top chucks. 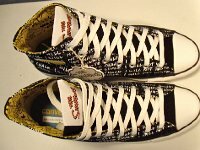 9 Bart Simpson High Top Chucks Front view of Bart Simpson print high top chucks. 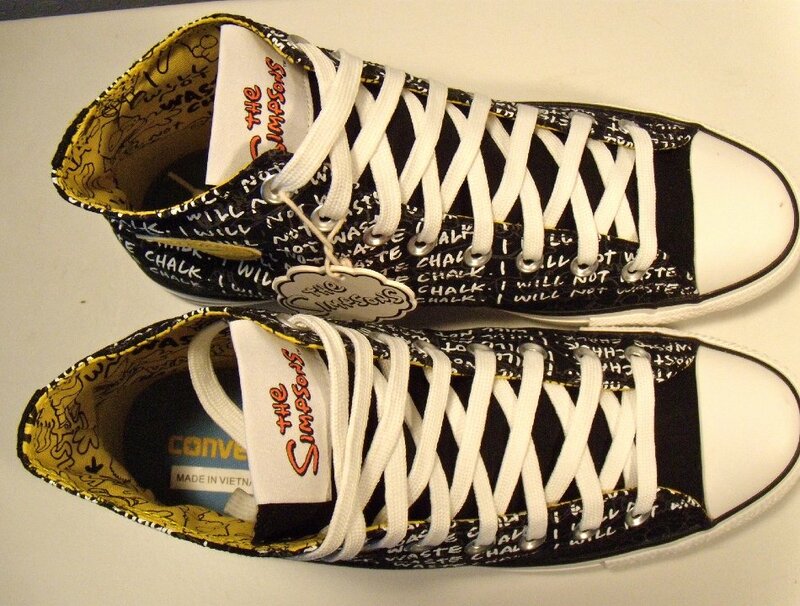 10 Bart Simpson High Top Chucks Top view of Bart Simpson print high top chucks. 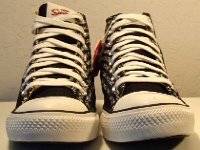 11 Bart Simpson High Top Chucks Inside patch views of Bart Simpson print high top chucks. 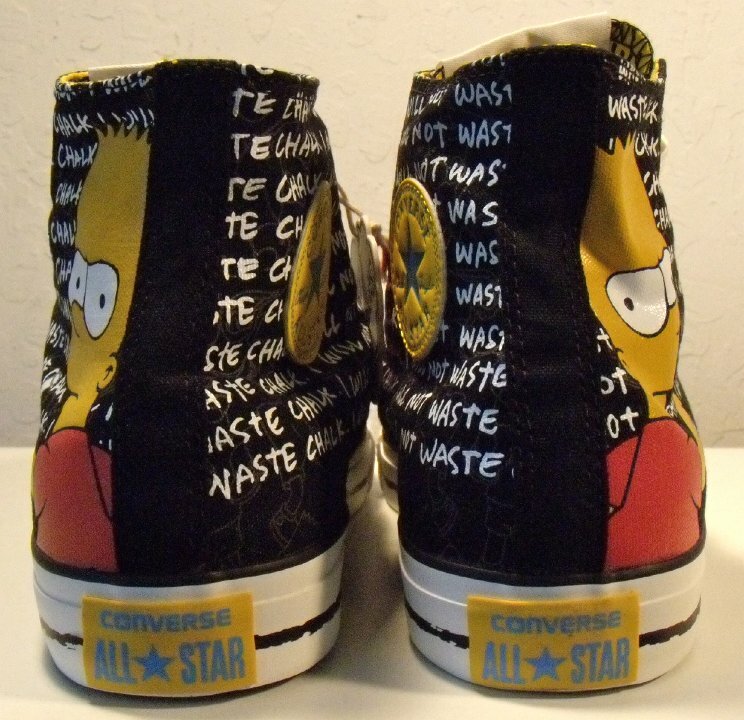 12 Bart Simpson High Top Chucks Outside views of Bart Simpson print high top chucks. 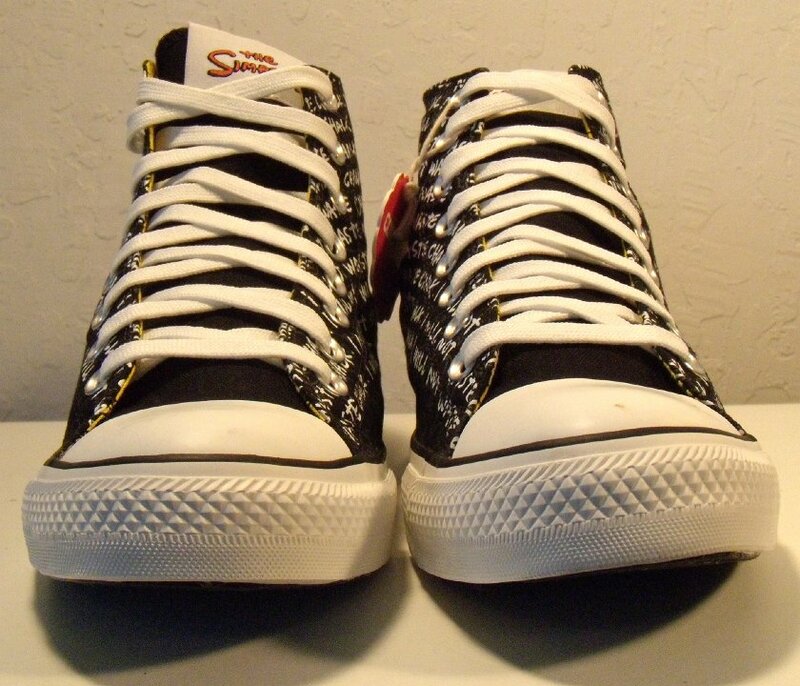 13 Bart Simpson High Top Chucks Inside patch and outer sole views of Bart Simpson print high top chucks. 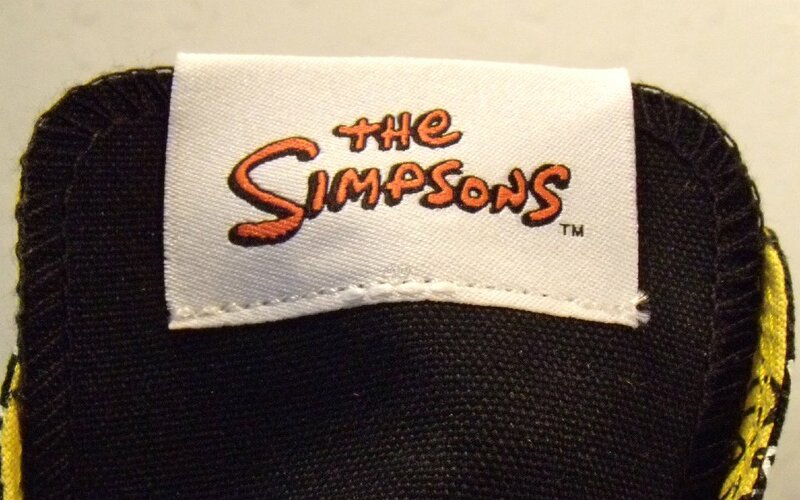 14 Bart Simpson High Top Chucks Close up of the Simpsons patch on the tongue of Bart Simpson print high top chucks. 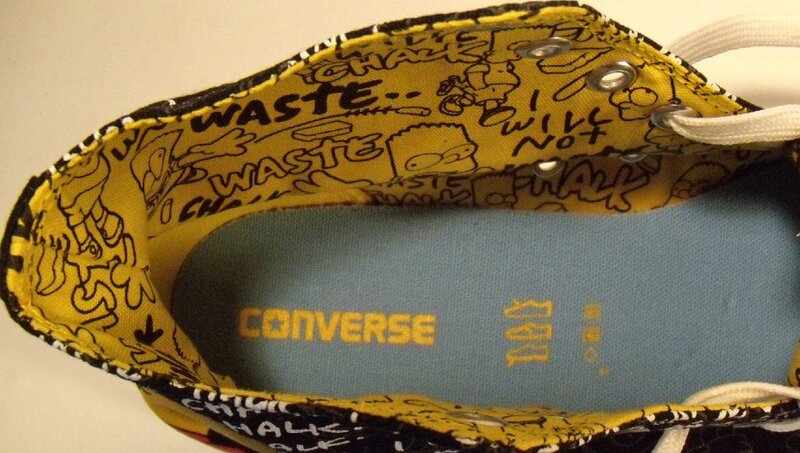 15 Bart Simpson High Top Chucks Close up the inner canvas print and insoles on Bart Simpson print high top chucks. 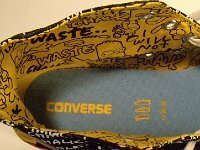 16 Bart Simpson High Top Chucks Closeup of the inner print on Bart Simpson print high top chucks. 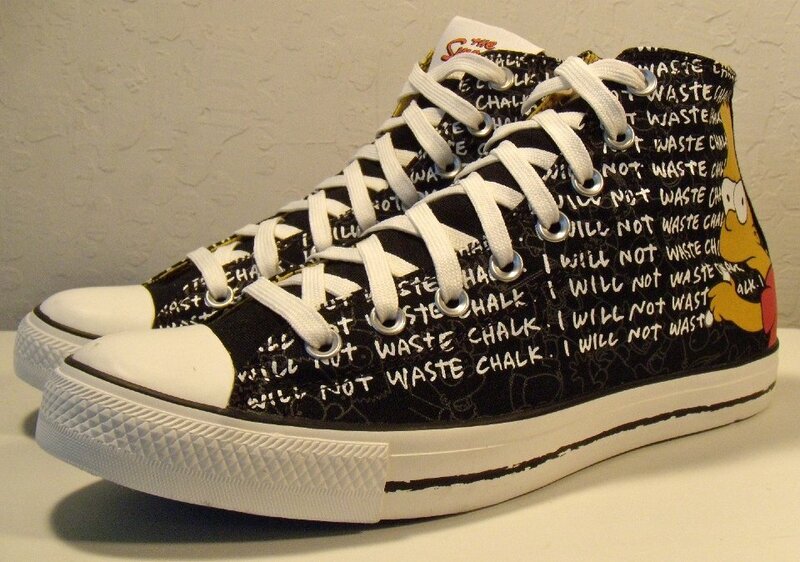 Bart Simpson "I Won't Waste Chalk" print black high top chucks are part of a set issued by Converse in tribute to the long time animated televsion series. 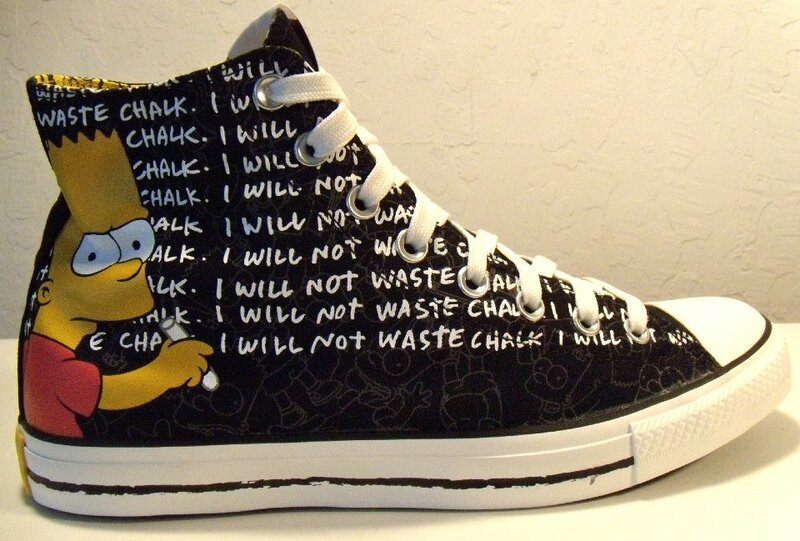 Bart in the show is always shown wearing what looks like high top chucks. 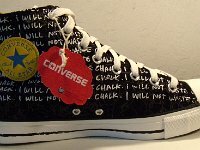 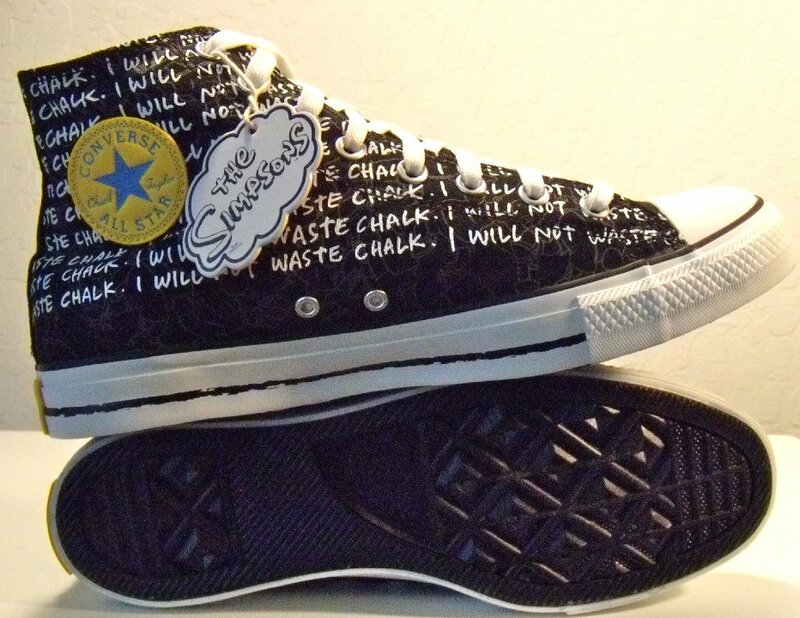 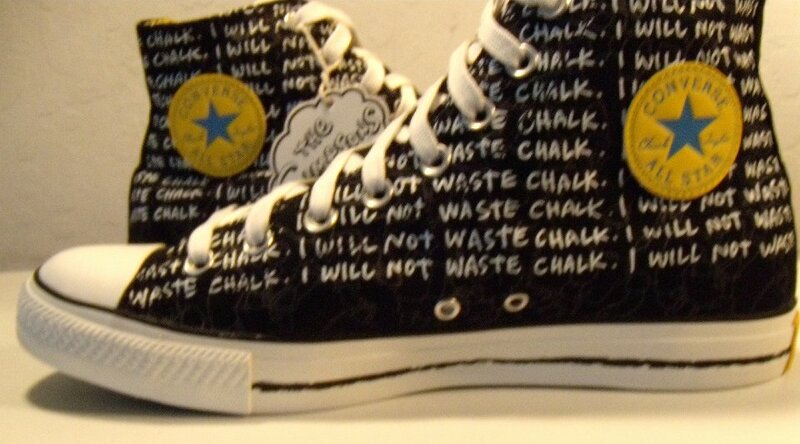 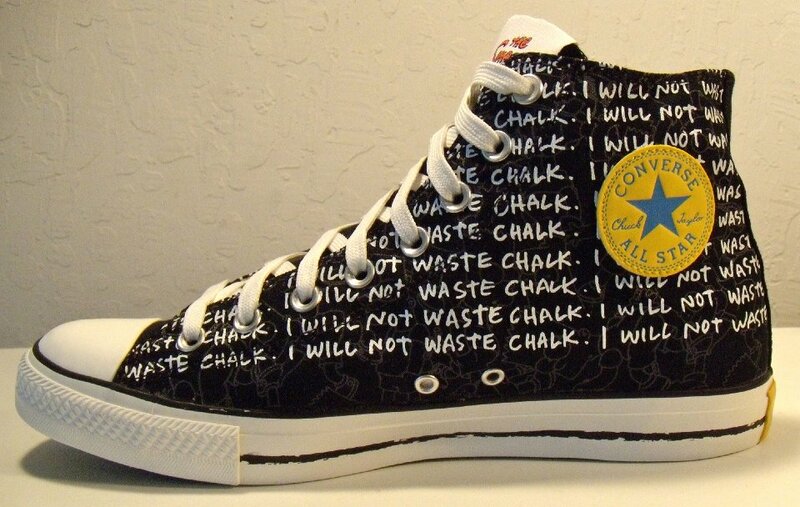 The inisde of these sneakers have a series of white text reading "I Won't Waste Chalk" over faint gold graphic images. 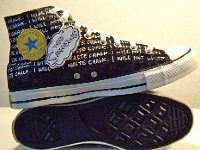 The ankle patch sewn on is yellow leather with a light blue star and lettering. 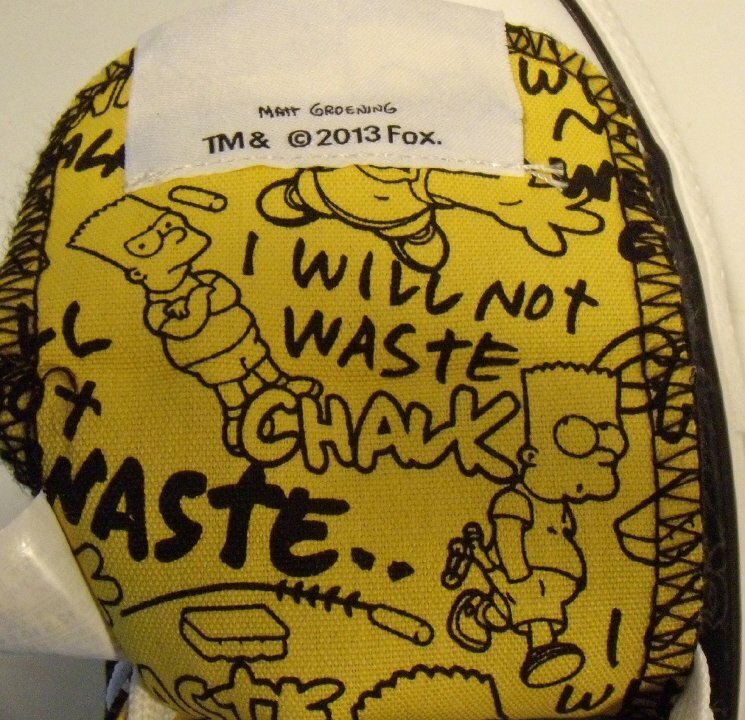 The outside canvas includes a graphic of Bart with a piece of chalk. 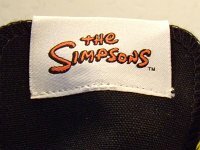 The tongues have a Simpsons patch. 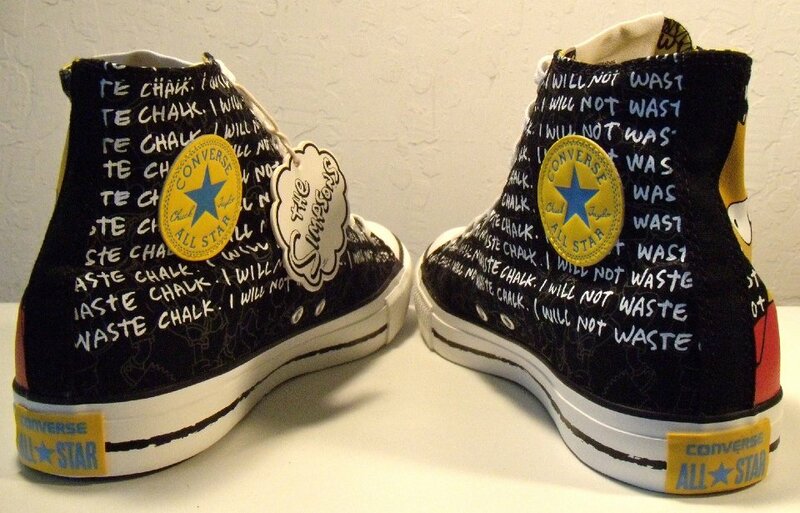 The heel patches are yellow and light blue matching the ankle patches. 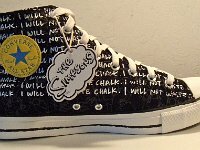 The insole are light blue with yellow printing. 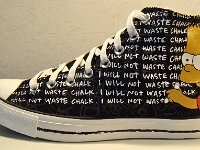 The inner canvas is yellow with an "I Won't Waste Chalk" graphic design in black. 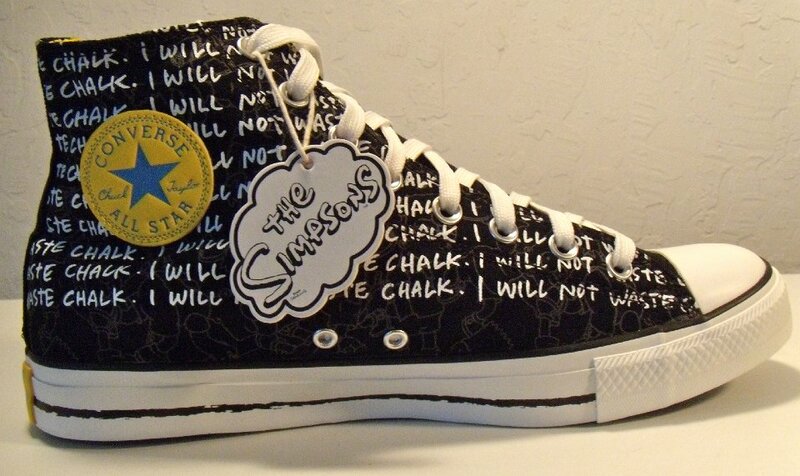 The shoes come with a special tag saying "The Simpsons" in black on white on one side and Converse in white on red on the other side.